Since our last update on the ongoing project to conserve the Mansion’s Reception Suite, Executive Director Tom Johnson and Assistant Director Tim Brosnihan joined up with stone conservator Ivan Myjer to investigate the possible sources of brownstone to rebuild the exterior of the badly deteriorated bay window. Large pieces of high-quality brownstone have been difficult to come by since the last quarry providing stone for restoration work closed in 2012. After several years of chasing down leads, it looks like we will have some exciting news to share in the future! 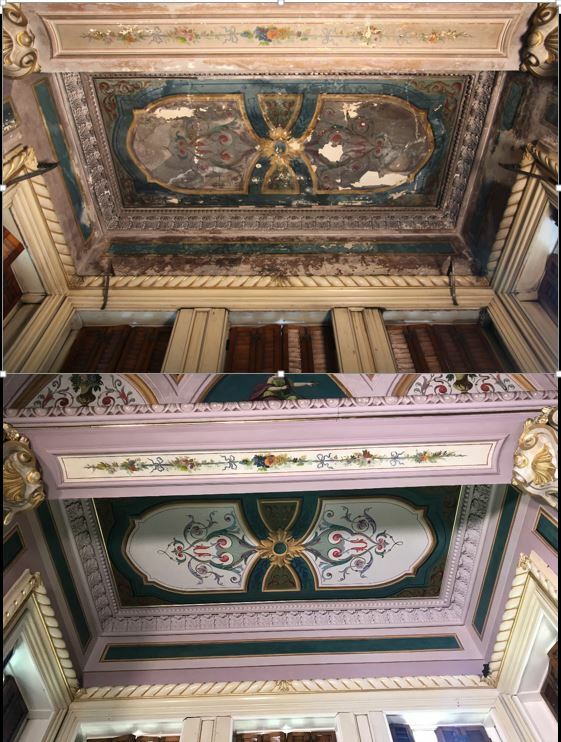 Meanwhile, conservators have completed and installed a replica of the damaged decoration in the interior of the bay to dramatic results (see image at right). Concurrently, the room’s massive and elegantly carved mirror frame and window cornices are being cleaned, conserved, and will soon be reinstalled. Recent visitors will also notice that the room’s mirror sconces and the original gasolier in the Suite’s small room have been reinstalled. Plans are underway for the next phase of the project, entailing the restoration of the Suite’s teal-colored silk brocade curtains and gold trimmings. Be sure to visit the Mansion soon to see the dramatic transformation for yourself!